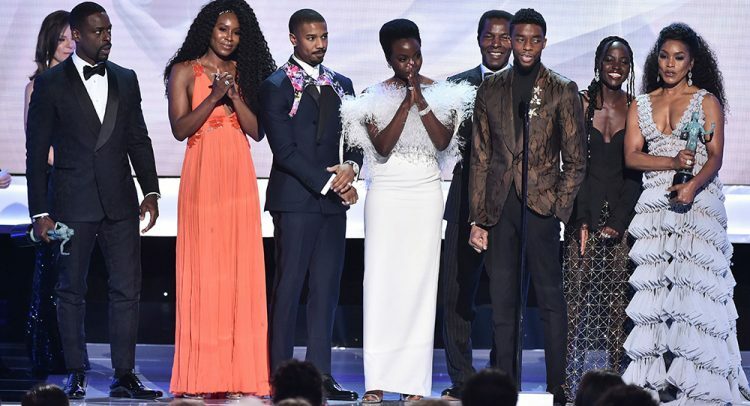 In what has proven to be a highly unpredictable awards season, “Black Panther” gained some major momentum on Sunday night. “We knew that we had something special, that we could create a world that exemplified a world that we wanted to see,” Boseman said. The cast of the streaming giant’s “The Marvelous Mrs. Maisel” took home three awards, including top performance by an ensemble in a comedy series. The show’s stars Tony Shalhoub and Rachel Brosnahan won individual awards as well. “I just want to say that the greatest honor of my life is to be nominated in the same category as Alan Arkin,” Shalhoub said during his speech. The cast of the NBC tear-jerker “This Is Us” won for top drama performance. Emily Blunt made husband John Krasinski emotional with her first SAG win for performance by a female actor in a supporting role for “A Quiet Place,” which Krasinski directed. “The entire experience of doing this with you has completely pierced my heart directly,” Blunt said of working with her husband. “You are a stunning filmmaker. I’m so lucky to be with you and to have done this film with you. Alda, who last year revealed he has Parkinson’s disease, received a standing ovation. “You’re just one job away, you’re plenty talented and hang in there,” he said. Sandra Oh won for her leading role in the drama series “Killing Eve.” She thanked several fellow actors of color who gave her encouragement over the years, including Jamie Foxx, Lena Waithe and Alfre Woodard.